As told by Roie Griego, president of FOHA based out of New England. "I received a distress message just before Christmas about this LA shelter that had a Boston mix mom and 4 pups that were going to the gas chamber. This shelter does not have a website and does not adopt to the public so their only chance was rescue. After much wrangling I was able to convince the shelter we were legit and to allow us to pull them rather than gas them to death! Delaine Henry kindly pulled the dogs for us and got them to a vet for safekeeping and vet care. My good friend Rocky Gates in LA helped get them to her vet for spays/neuters/boarding and is now keeping mom Lainie for me while she goes through heart worm treatment. Demi at the vet's office called me after a week of them being boarded at her vet and asked if she could take them home and foster until transport. I was thrilled and said yes! - she fosters for Rocky sometimes so I knew she was great! Rocky kindly helped get them to my good friends Donna Farmer in AL with Evelyn Bibb's help and then got them to the airport for us. 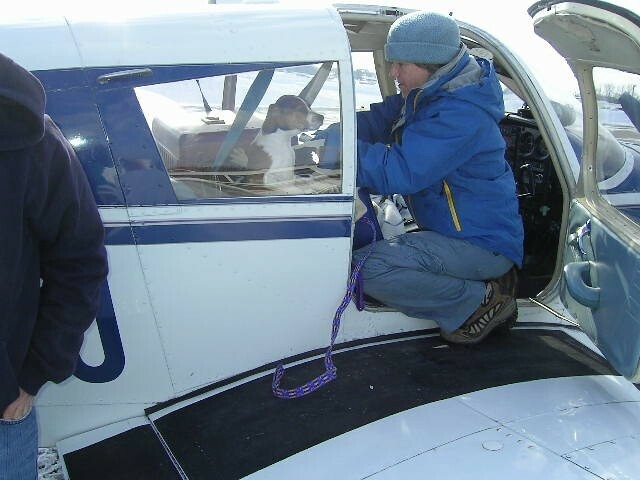 Then all the help of Marlana and the super pilots flying these pups - unbelievable!!! 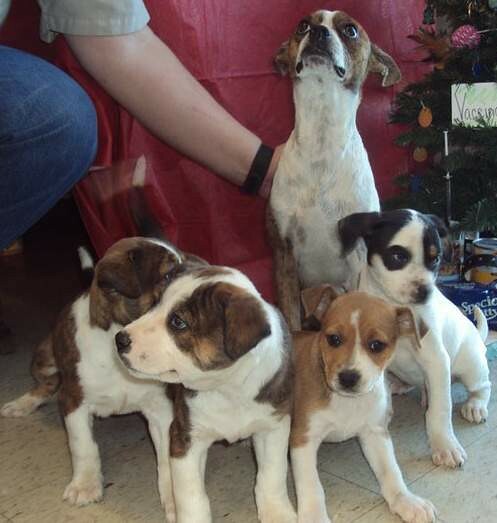 This was more than a team effort - this was a Christmas miracle because we saved them from death right before Christmas!" 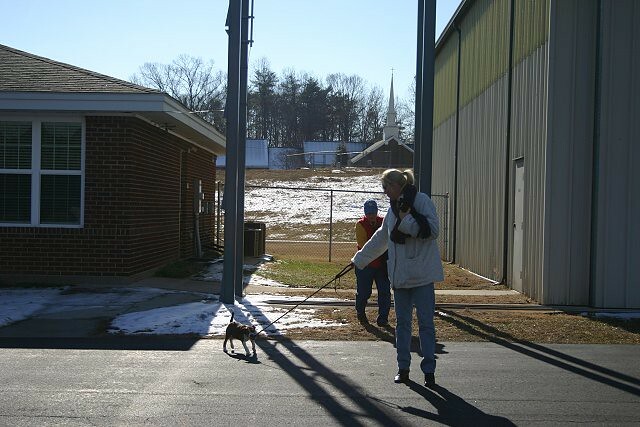 Zeb jumped on this transport at Reidsville, NC. He showed up as a stray with another dog, a yellow lab, the last of Oct/first of Nov. 2010. Animal control caught the yellow lab but could not catch Zeb. One morning, Deb, soon to be Zebs’ foster mom, saw two guys that were stopped in front of her house. She walked out to see what they were doing. They were trying to catch Zeb. They asked if he was her dog and he wasn’t and he wasn’t their dog either. He was a stray that had been roaming the area. The two guys were having problems trying to get hold of him so Deb offered to go back into her house to get a crate for them. When she walked back out, one of the guys had his rifle out. It appeared that he was going to shoot the dog. Deb stopped them and said she would take him. The guy said that he was not going to shoot the dog; he was going to shoot the rifle in the air to scare him. Of course this does not make sense since they were trying to catch him. Go figure! 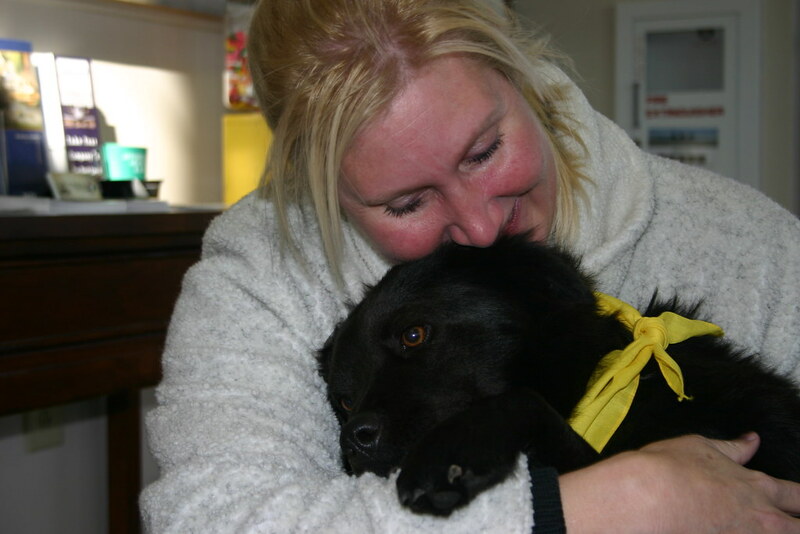 Deb took Zeb in as a foster and made contact with local rescue groups in helping to find someone to take him in. She already had 9 dogs of her own and did not need nor could she afford another one. Plus out of 9 dogs, 7 of hers are dominating males that think they own the place. This made it rough on keeping Zeb since the males were mean to him but the females were fine. One of her females and Zeb played together all the time and became best buddies. Between two rescue groups, we have cross posted Zeb numerous times without any interest. It seemed that other groups did not care for a black dog, over a year old. He was up to date on all vaccines, hw negative, neutered house and crate trained but still he was a black dog that is over a year old. Deb's health was starting to go downhill and she was recently released from her job, this made it even more urgent to find a rescue group to take Zeb. At one point, Zeb was boarded at a kennel but Deb felt so bad and missed him so much that she asked to have him back until we could find a group for him. Finally, I searched the internet for specific groups that rescued only black dogs. This is when I came in contact with Jessica with Black Dog Rescue located in Poland, ME. After doing her vet check and speaking with Jessica, we felt that she would do right by Zeb and find him his forever home in ME away from ignorant guys with rifles. 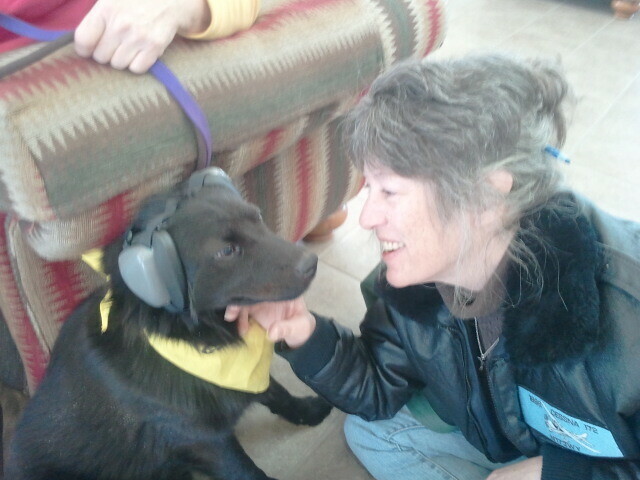 Zeb and his foster Mom Deb. This beautiful animal had been wandering as a stray before Deb took him in. Team Mutt Muffs flew leg 3 of this Happy New Year story. 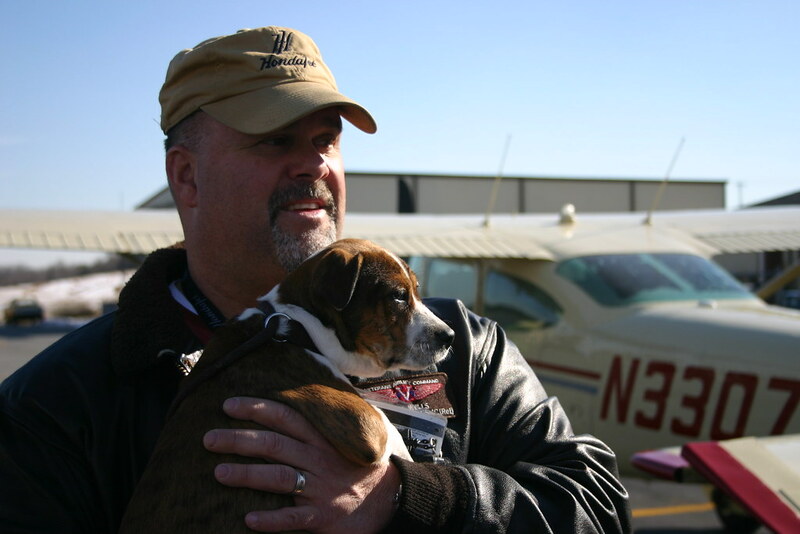 We meet Zeb at the Shiloh airport (KSIF). Here he gives Peggy a big thank you kiss. 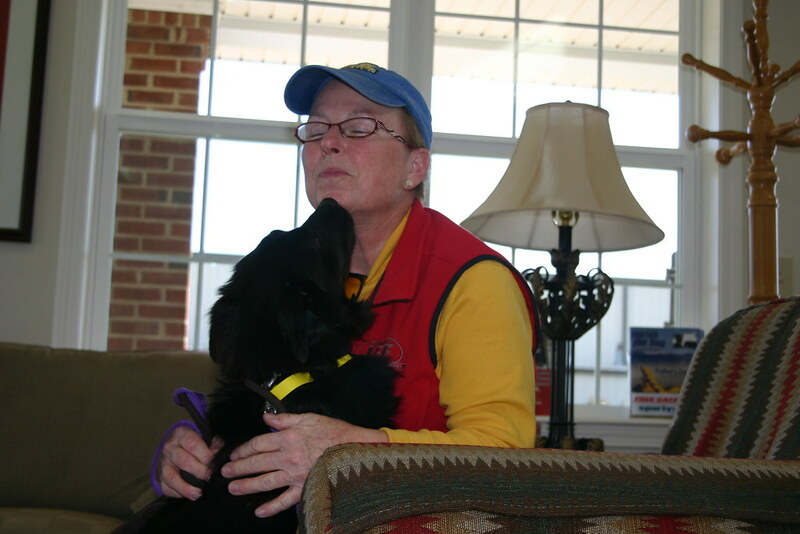 She and Pam drove this wonderful boy three hours from Wilson, NC to Reidsville so he could catch this flight to freedom. Zeb is an absolute joy. 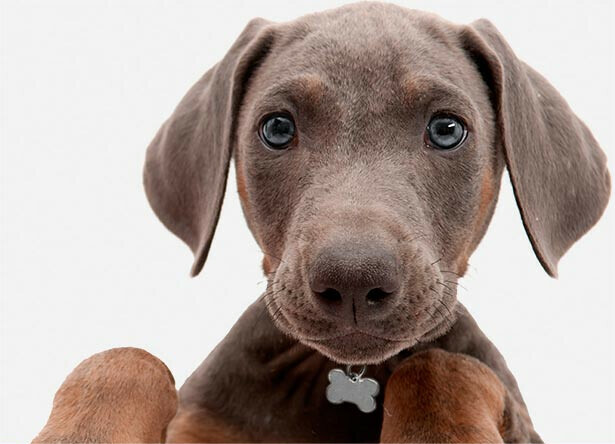 As is common for dogs who have had a rough stretch in life, they are SO grateful for any kindness. That looks like the right size. Now we just wait for the puppies to arrive. 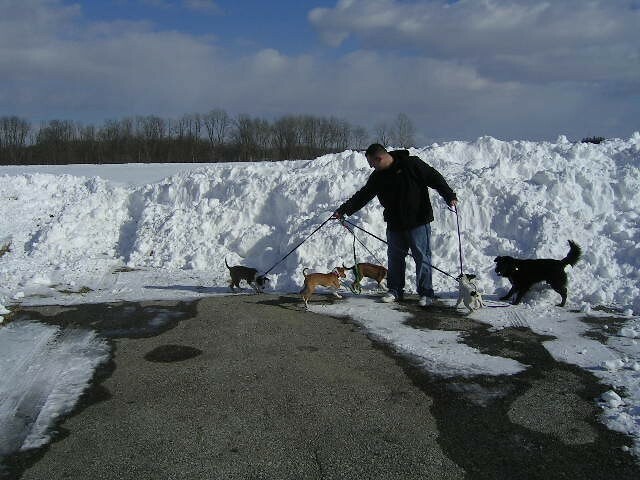 Leg 2 Pilot Jon arrives with the puppies. He flew to Alabama in the pre-dawn hours to pick up these cuties so that we could get this transport as far north as we could in one day. Pam helps us load up the brood so we can get leg 3 underway. This will be their last flight of the day. Leg 4 pilot Elliott offered overnight hospitality for Zeb and the pups. Apparently puppies intuitively know what all seasoned air travelers do. If you sleep on the flight, you'll be well-rested and ready to play when you land. 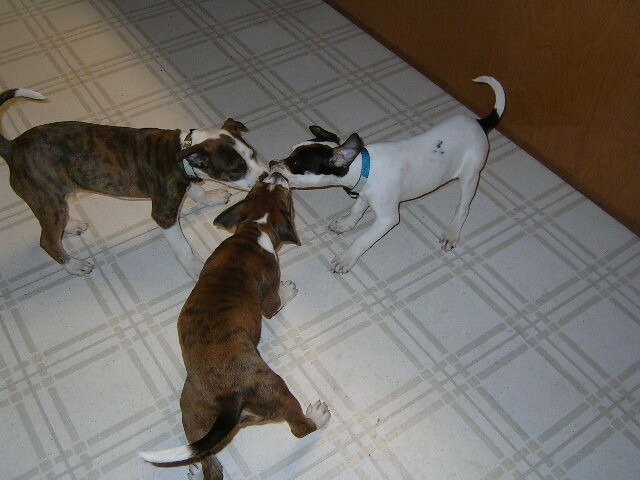 Here they are playing tug at Elliott's house in Maryland. 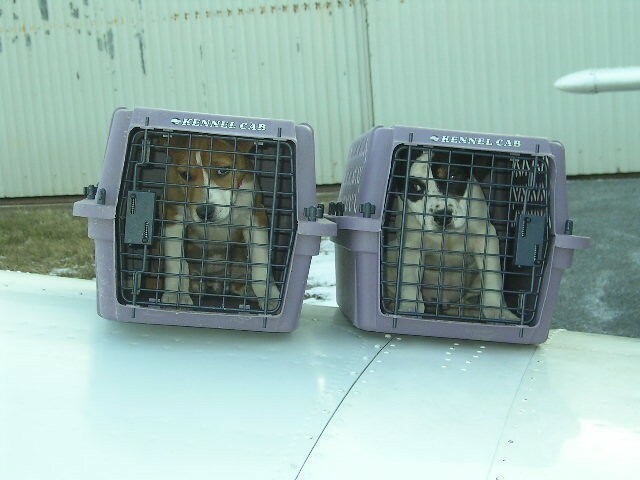 One last flight for the puppies. 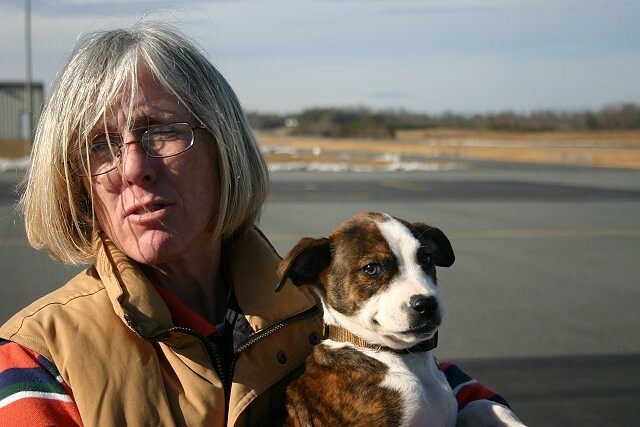 Margery will now fly them to Nashua, NH where they will find new families waiting for them. Zeb continued on to Maine, where I know he won't wait very long for his new family. We were right! Jet (formerly Zeb) found the perfect family right away!! 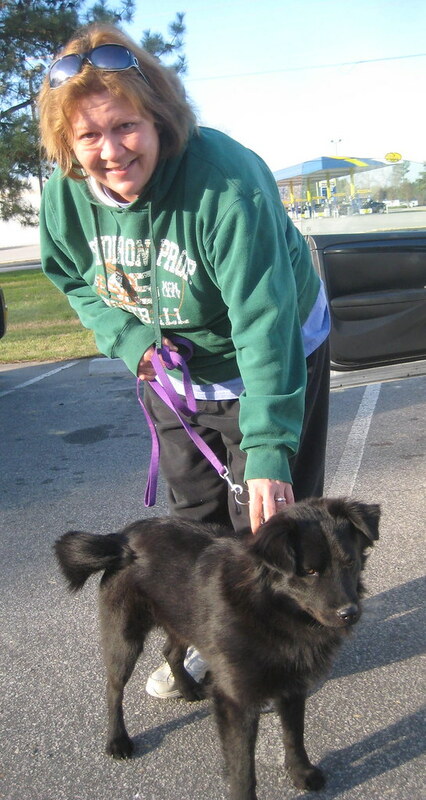 His new family finished their paperwork today and decided to adopt Jet! He loved the two kids...the little boy thought he was so special, he held the leash and Jet just followed him around everywhere. The parents are teachers, although the mom mostly stays home. They live a couple hours north of me and have no other pets and have been looking for the perfect dog for months. They were so excited and I think they will love him more than he could ever have dreamed. What a wonderful happy ending for him! Thanks to everyone's hard work, this guy has his own family now!